Before I set out on my first visit to Greece, a philhellene friend said, 'You'll fall under the spell of the old.' I rather thought she was talking about the Ancient World, but she was talking about old people: she had lived in a Greek village for some years. She was right: the spell worked. I became very attached to my husband's four uncles: Evangelos, George One and George Two, and Philopoemis. All had the relaxed charm of survivors who have struggled through hard times, but have ultimately achieved their goals, the most important of which involved doing their best by God and the Family. They had also retained great vitality and humour: sometimes, after hearing their tales of the past, of war, poverty and death, I wondered how. For them I had the value of novelty, as I was the first foreign woman they had ever met. My relationship with old women, particularly that with my mother-in-law, the redoubtable Aphrodite, was often more complex. But I was still in a fair way to be magicked, and now I am sorry that the old people I became so fond of are no more. I miss them. But then last Christmas I met Yiayia Iphigenia, my daughter-in-law Katerina's grandmother, and was enchanted all over again, by both name and person. In a scarcely more palatable account, the goddess Artemis whisked her away, leaving a sacrificial deer in her place. Artemis then decreed that Iphigenia should be an acolyte at one of her island temples, where her specific job was to kill any man that set foot on the beach. Of course one fine day her brother inevitably happens along. Lots of pity and terror then ensue. I learned that there had also been ample sorrow and trauma in the life of the modern Iphigenia. 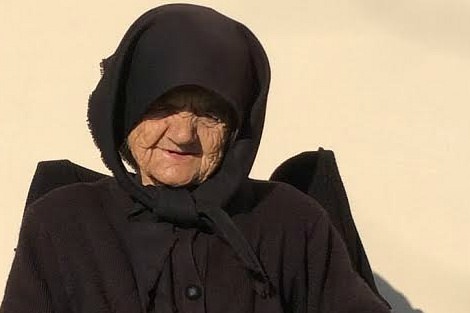 It was a bright winter's day when we visited Yiayia Iphigenia in her village. She was sitting outside in the sun, as the old anywhere love to do. Long widowed, she was dressed in black, and was meticulously turned out: headscarf, apron, the whole traditional outfit. Iphigenia is not sure how old she is, for in her day girls were not usually registered at birth; boys were, for purposes of later compulsory national service. She thinks she is about 86. Iphigenia's was a hard life in anyone's book. Orphaned at six, she was then at the mercy of her aunts. Shunted from house to house, she was often beaten, and when with one aunt was forced to sleep outside with the dog. 'At least the dog kept me warm,' she said. Her memories, too, are those of pain, war, and loss. She married at 17, no doubt by proxenio, arrangement, and two of her babies died. When the next baby happened along, Iphigenia decided to test her faith via an old custom: she left the baby by the side of the road, and the first person to pick her up became the godparent. Iphigenia had not a shadow of doubt that this baby would grow and flourish. And so she did: she grew up to become Katerina's mother. One of the many gifts Greece has given my three sons is that of respect and understanding of the aged. It was obvious that both Iphigenia and Niko enjoyed their conversation, and he listened carefully when she gave him advice. 'Never complain,' she instructed, 'and be thrifty: always keep crabs in your pockets.' Nik laughed and promised he would. Time passed very quickly in Yiayia Iphigenia's entertaining company. And then we had to go. She resumed her seat in the sun; we walked down her garden path. As we turned to wave goodbye, she made the sign of the cross. Greece has given me, too, many gifts and taught me many lessons. That brief time with Iphigenia reminded me of what I had learned long ago in the village: the supreme value of the human spirit, and how to resist the erosion of it. I have been a teacher all my working life, but with villagers I became a pupil. I am always happy when I open Eureka Street and see you have written Gillian. Your short word pictures carry so much compassion and humanity in their deceptive simplicity. Thank you - and may you live long than I do and keep on writing! Thank you Gillian. I have a Greek friend who enriches my life with Greek coffee and legends. That really cheered me up. What a character. She certainly had plenty of that! Lovely reminder Gillian of all that Greece has to teach us. The world has certainly changed out of all recognition when compared with the lives of the oldies. I agree that they still have a lot to teach us. Keep up the good work. You present the character of Yiayia Iphigenia well Gillian. I feel that I have now met her, and indeed even share a sense of remorse that I now have to leave her sitting there; in her black garb absorbing the warmth of the winter sun. I am struck by a perceived contrast between Iphigenia's situation - still accorded a respected role in her family, her community, her culture - and that of many elder members of contemporary Australian society, who all too often, having entrusted power of attorney to a close family member, find themselves bundled away into aged-care "facilities" - often against their wishes and despite their capacity to contribute to their community - where they no longer have a sense of place or worth. Whatever the material lack may be, I think that in many ways life is richer for the aged in a traditional culture like that of Greece, where they are still honoured and valued and respected. May this attitude continue to prevail, and I wish there were more of it here in Australia. I agree wholeheartedly with Jena Woodhouse. We certainly have a better economy than Greece, but the dignity we attribute to our aged in comparison is often appalling; an example perhaps, being placed iin front of perpetual TV all day in a nursing home. This I believe is akin to dumping them in Disneyland until they die, and yet we kid ourselves that we are doing the right thing. With more than 30 dead in Brussels just a few short months after the horrors in Paris, the Western world again confronts an assailant in ISIS who deals in fear and bloodshed. In contemplating our responses to such attacks we recognise the historical and current geopolitical realities that have bred the ideologies that fuel them. This messiness is the stuff of a new British film that arrives in Australia this week, which explores the plight of those who might be 'collateral damage' in the hyper-technological 'war on terror'. To be fair, he wasn't a leaner, he was one of the lifters. Helped to keep the country running, so to speak, and speak he did often, on many topics. He was a leader, and felt justified when others, in the region, followed his lead. It wasn't that he didn't see Lazarus, but more that he saw him differently. Break the rules, help one starving beggar and before you know it there will be a flood of them on your door step. That's how he argued and plenty agreed. Judgement day was a long way off.